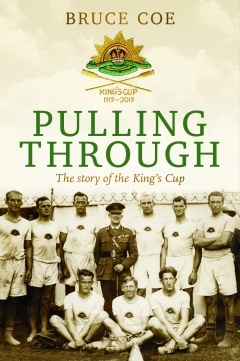 The story behind the winning of the 1919 King’s Cup by the Australian Imperial Forces No. 1 crew is fascinating. Wartime authorities created diversions for war weary soldiers who needed activities as they waited for up to two years for transport home. The recovery from the ravages of war through sport became a significant benefit of these activities. The selection processes had the added difficulties of locating, gathering, maintaining and dealing with men recovering from the rigors of war. War-hardened soldiers demanded coaches to coach them in the style they had been used to before the conflict. But in the end, they enjoyed tough racing, and then success in winning the King’s Cup at the Henley Peace Regatta, the regatta at which they all sought to race. The story did not end there. War time authorities sought to keep the King’s Cup as a trophy of war. The rowers and astute administrators of the time had other ideas. After failing through traditional channels to claim the Cup, they petitioned the King to allow the trophy to become the perpetual trophy to be presented to the winners of the Men’s Interstate Eight-Oared Championship of Australia. Given the large number of rower soldiers in WWI, the request could not be denied, eventually confirmed by the Secretary of State for the Colonies, Winston Churchill. The story, and the recognition of rowers who served in WWI, will continue, in perpetuity, as the states battle to win this prized trophy each year.